Nepal is a landlocked country in Southern Asia, between China and India. It contains eight of the world's 10 highest peaks, including Mount Everest - the world's tallest - on the border with Tibet. It recently was declared a republic and has abolished the monarchy. Behind the Vishnu shrine of Ichangu Narayan, northwest of Swayambhunath in the Kathmandu Valley, rises the 'Abode of Snows' (Himalaya in Sanskrit), a magnet for trekkers and mountaineers the world over. Only in Nepal can you trek for weeks without the need even for a tent. No longer does your name have to be Tenzing or Hillary to set foot in Everest Base Camp. Out of the mountains, get your adrenaline kick from world-class white-water rafting, kayaking and mountain biking, or from the spine-tingling sight of your first tiger or rhino in Royal Chitwan National Park. 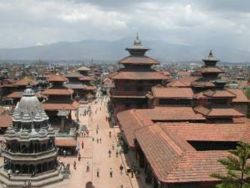 Kathmandu is the arrival point for most of the visitors in Nepal. This small mountain sheltered valley is the historic center and the Capital of Nepal. This is the place where kingdoms rose and fell, palaces and temples are built and rebuilt, art and cultures are refined and protected. Kathmandu city is the largest in Nepal and is surrounded by green hills all over. Scattered around the valley are hundreds of temples and shrines, traditional villages and agriculture scenes of timeless beauty. You can see all these places by taxi, cycle, bus and by foot. Patan is separated form Kathmandu only by the Bagmati River and is the second largest town in the valley. It is also known as Lalitpur, which means city of beauty. Patan has a long Buddhist history and have stupas at four corners. Like Kathmandu Durbar Square, Patan Durbar Square is also packed with temples. Most of these temples are built during the Malla kings period. Bhaktapur is also known as Bhadgaon or the city of Devotees, is the third major town of the Kathmandu Valley. Bhaktapur was the capital of the whole valley during the 14th to 16th century. Much of the towns great architecture dates from the end of 17th century. This town is also well known as Newari Architecture town. Bhaktapur rises upon the northern bank of Hanumante River. Durbar Square are charged a fee . Known as the jumping ground for the best trekking in Nepal, the Pokhara Valley lies 200 kms. west of Kathmandu, enriched with gorgeous lakes and surrounded by picturesque mountains. The Patan Museum displays the traditional sacred art of Nepal in an illustrious architectural setting. Its home is an old residential court of Patan Darbar, one of the royal palaces of the former Malla kings of the Kathmandu Valley. Its gilded door and window face one of the most beautiful squares in the world. 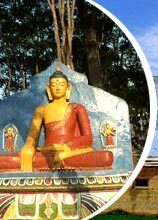 The museum's exhibits cover a long span of Nepal's cultural history and some rare objects are among its treasures. 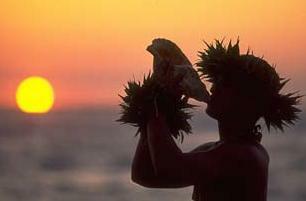 Their meaning and context within the living traditions of Hinduism and Buddhism are explained. Most of the objects are cast bronzes and gilt copper reposse� work, traditional crafts for which Patan is famous. May and early June are not the best times to visit as it is extremely hot and dusty, with temperatures often above 30�C, and the coming monsoon seems to hang over you like a threat. The most prevalent Nepali dish is 'Daal, Bhaat and Tarkaari' (lentils, rice, vegetable curry respectively). This is the main course served in the most Nepalese houses irrespective of the economic conditions, that too in both lunch as well as dinner. Nepali food is much less spicy than Indian food, and many dishes are Tibetan in origin. It seems that Indian influence is only confined to Southwestern part of Nepal. The rest of Nepal has more of Tibetan and Chinese influence in their cuisines. Two of the most exclusive and authentic Nepalese delicacies include 'Momos', a meat or vegetable filled dumpling that is similar to Chinese pot-stickers and Tibetan Bread and Honey; a puffy fried bread with heavy raw honey. Both of these items are good for a light breakfast but are insufficient for a full meal. One delicacy that you do not want to miss while in Nepal is the Dried meat. It makes a deadly combo with beer or any other alcoholic beverages. Newars, an ethnic group, are considered connoisseur of great foods. Watch out for Newari Restaurants. Surely it will be a great way to enjoy good food. In the Everest region try the local Sherpa dish of potato pancakes that are called Rikikul. They are delicious eaten straight off the griddle and covered with yak butter or cheese. Tribhuwan International Airport at Kathmandu is the sole international airport in Nepal. The airport is well equipped to handle international flights of all kind, make and size. The airport has good transit facilities though service is not world class. The officials are co-operative and the immigration process is very simple. Kathmandu has direct or indirect flights from nearly all the major cities in Eurasia and Americas. There are direct flights to Asian cities like Delhi, Mumbai, Dhaka, Karachi, Islamabad, Sanghai, Singapore, Tokyo, Dubai, Doha and Abu Dhabi. Among the European cities, flights are available from Paris, London, Berlin, Berne, Frankfurt, Vienna, Munich, Moscow and Amsterdam. Apart from that, regular flights are available from New York, Los Angeles and Tel Aviv too.